Im a little worried about Teemos schedule. Hes not coming out to eat until at least after 8:30AM. Granted hes always in his pouch and whenever i look in, whether it be morning, afternoon, evening, night, etc hes always awake. Is there any way to change his sleep schedule? Ive already swapped the light bulbs(Im up all night) with Red bulbs so I dont disturb him with the light. Just worries me because I got him knowing I could give him attention and play with him at night, but if hes awake during midday I wont be able to consistently . Try turning off all the lights and listen for the sound of him outside his pouch. It may be that the red lights do bother him. I've had my two for a month, and only this past week were they willing to come out and play by the light of a single table lamp. I read somewhere that red light doesnt bother them, i sure hope that was good info! If not its more money I wasted on bad glider info lol. I cant remember where I read that though. 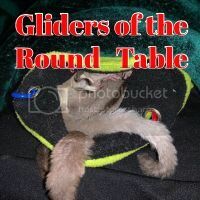 It may be fine for most gliders, but ones still in new environments, who are still shy around new owners, may only be comfortable in complete darkness. Just one theory. I probably just read bad info, knowing my luck, lol. The red light is probably not the problem - unless you have several to create enough light for you to see clearly. Most folks use a single red light just to illuminate the area just enough to see the gliders while they play. The problem may be the lighting in the area of the cage during the DAYTIME. Being nocturnal animal does not mean he wants or needs darkness 24/7. Gliders need light during normal daylight hours to regulate their internal clock and nocturnal activity. If you are keeping the room dark during the daytime your glider looses his cue to go to sleep at sunrise and wake up at sunset. Try positioning the cage where he has sunlight during the day time, or leaving the lights on near the cage from sunrise to sunset. Then darken the room and use a single red light to be able to observe his activity. My gliders are OK with the light from my laptop screen or a small television in the room but if I leave a lamp on they will not come out of their pouches even if dinner has been served and I know they are hungry after sleeping all day. I raised the blinds this morning to make sure the most sunlight possible got into the room and when i got home he didnt crab at all when I took his pouch out of the cage, which is a first, so I think it worked! Thanks guys, so glad I found this site. Gliders need light during normal daylight hours to regulate their internal clock and nocturnal activity.